I need to move back to Brooklyn. I lived there when I first moved to NYC because I couldn’t find a place in Manhattan. And now that I live in the city, I kinda wish I was back on the other side of the river. It’s just so nice there. People seem happier. Seriously, I think people smile more in Brooklyn. At the very least, they seem more relaxed and look more well-rested. Then again, most everyone looks more well-rested when compared to me. 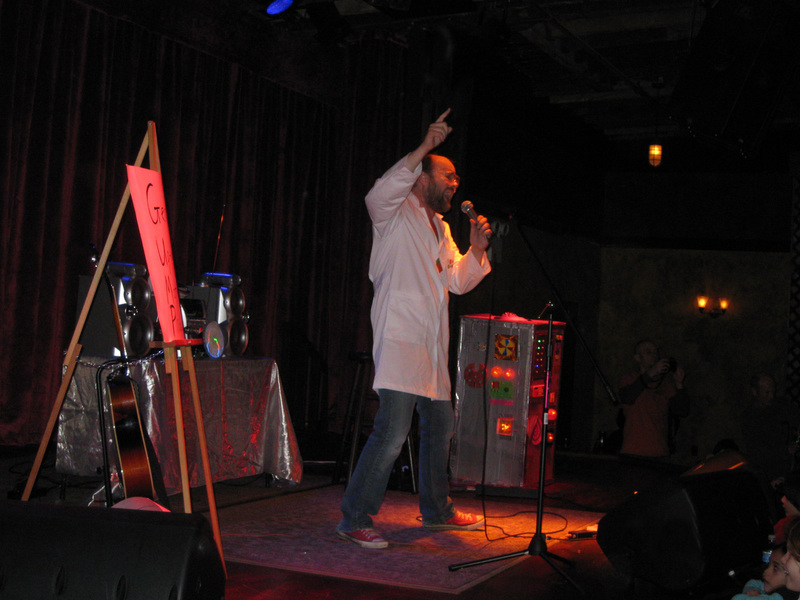 I often get these Brooklyn blues whenever I go there for a show, to visit friends, have dinner, drinks – whatever. Maybe it’s because I live in a no man’s land surrounded by Little Italy, SoHo, NoLita and Chinatown – and there’s always people milling around, honking their horns, screaming their stupid drunk heads off and the like. Or maybe I’m just getting old and I want a quieter, more laid back lifestyle. I don’t know. But when I went to DUMBO today to hit up the Fifth Annual Brooklyn Winter Hoedown, to see Sufferin’ Succotash whip up some sweet bluegrass over brunch – I missed Brooklyn again. But I was happy to be back, and even happier to be hitting up a show around noon, so I could relax on a Sunday night for a change. I’ve never known Superfine to be much of a music “venue” per se. But it is a good restaurant, and a decent bar. It was the only place around to get a drink back when I worked in DUMBO around 6 years ago. 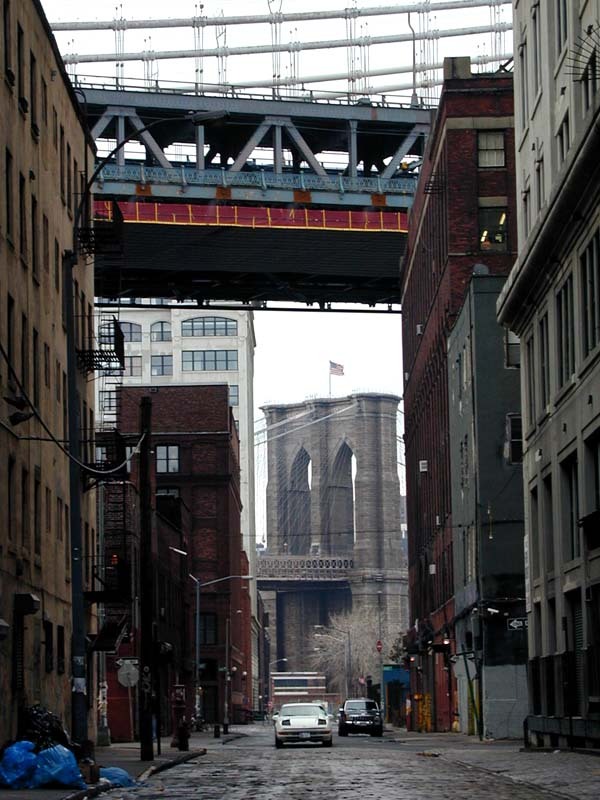 But now DUMBO is like the new SoHo, bustling with shopping, restaurants and bars. I woke up later than I had planned today, since I went to bed way later than I had planned, after being out way later than I had planned — all of which I blame on Daylight Savings Time, and $9 Jack and Cokes. Damnit, that’s right. Those drinks were expensive. But I managed to peel my face off my pillow, throw myself in the shower, and make it out to Bklyn before Sufferin’ Succotash started playing. Yippee. 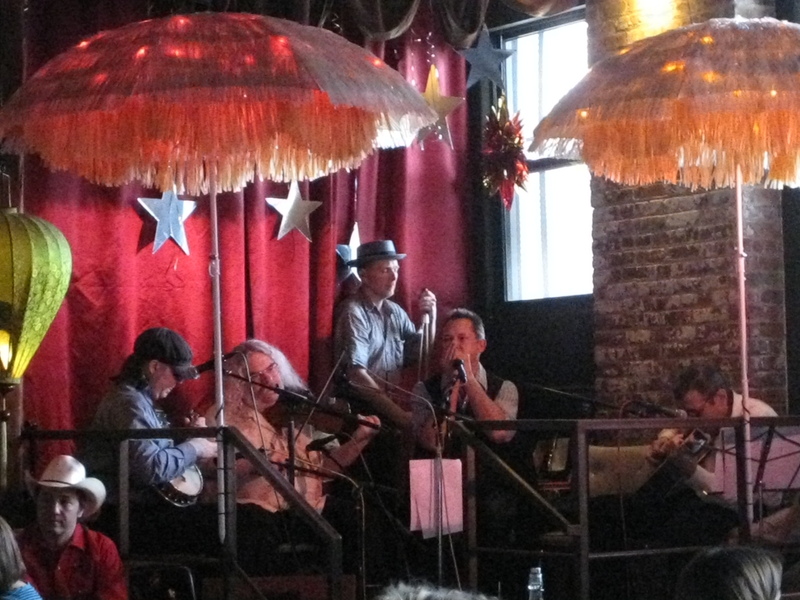 Today was day 3 (the last day) of the Brooklyn Winter Hoedown, presented by Dock Oscar. They’ve been doing this for 5 years now? Who knew? All I knew was that it was a day show, and bluegrass music – which I like and haven’t seen yet. And I could get food at the same time. Two birds = one show. Sufferin’ Succotash were good. I don’t listen to bluegrass enough to be all that discerning, mind you. But it was a nice way to see a band on a Sunday afternoon. Relaxing bluegrass music, Huevos Rancheros and Brooklyn. It’s just a shame I had to go back to Manhattan after. Crowded. Crowded. Crowded. That’s what you need to know about this show, right off the bat. Who knew that so many other people didn’t have dinner plans on Valentine’s Day? Or, I guess, plans after dinner since it was a late show (doors were at 10p). I was definitely surprised at how slammed Southpaw was for this show. Thankfully, I didn’t have to worry about getting in since the drummer in one of the bands put me on the guest list (thanks Kevin). Yes, my first official guest list, “I’m with the band” moment on this project. Let’s hope it’s not the last. I got to the club at 10:30ish, just in time to see Phil and the Osophers as they hit the stage. They are a fun, sparse, three-piece band with off-kilter indie pop songs that work at times, and could use some work at other times. They warmed up the crowd for Shilpa Ray and Her Happy Hookers which I’m not going to spend any time writing about because I just didn’t get it. She plays a harmonium, which is cool. But that’s where it ended for me. Bleh. When I planned on going to the show, I didn’t even really ask any friends to go since it was Valentine’s Day. But then my co-worker Allison said she, Crystal, Jolina and Lauren were all going. Then my friend Kris found me on IM and said he was going to tag along. And finally Jeremy hit me up on Facebook to let me know he was, too. Sweet. I have a music posse tonight. After Shilpa stopped squeezing her harmonium and screaming her head off, the music posse made its way downstairs to wait for the Harlem Shakes to hit the stage. I hadn’t seen the Shakes for a while, and I don’t remember being blown away by them then, so I wasn’t sure what to expect. I have their first EP, which isn’t bad. But now they have a new record coming out in March, so I’m looking forward to seeing where they have taken things. And I was pleasantly surprised, because Harlem Shakes sounded really great tonight. Ok, I’m not being 100% honest if I don’t mention how, despite them sounding great, their sheer and utter hipster douchiness drove me a bit crazy. Just take one look at the pictures and you’ll see what I mean. There appears to be absolutely no irony in how they’ve styled themselves. 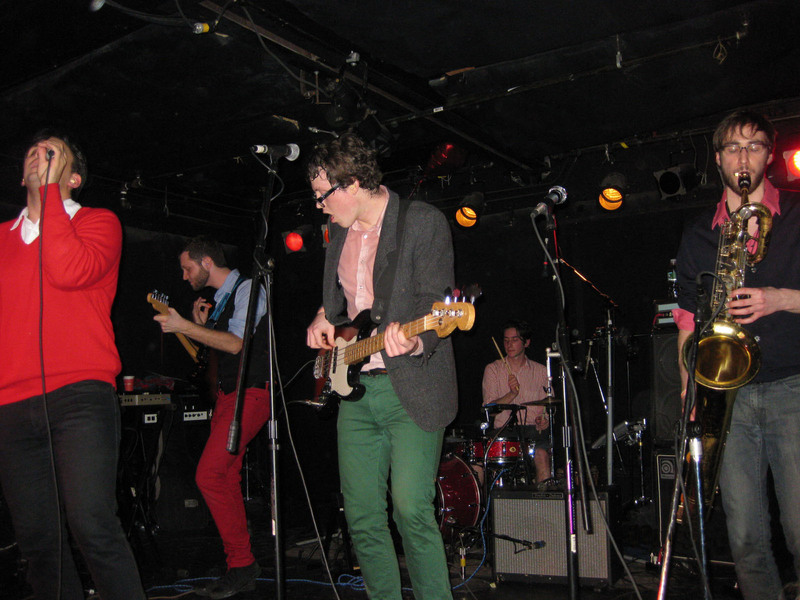 Ok, maybe the lead singer wore sweater in honor of Valentine’s Day. But, I digress. Back to the music. Like I said, Harlem Shakes sounded great. They’ve really come a long way since I last saw them (I can’t recall when that was exactly). Their songs are nice and full. The live sax and trumpet is a nice touch, and they just really sounded tight, polished and confident. I talked to the singer for a minute after the show, and he didn’t seem to feel one way or another about the project. Which is fine. Not everyone’s impressed with the journey. Or maybe he was just self-conscious about his silly red sweater and didn’t want to talk? I’d like to think it’s that one. Yea, I’m going with that. © 2009 100 BANDS in 100 DAYS | Powered by WordPress | Theme 'Sirup' by 1000ff | 32 queries 0.444 sec.